(Dan Trimmer, 1999). Tet (Fooled Me x Jungle Mask) Evergreen 6” M re 30” RASPBERRY BERET represents a break in size and color in the filed of colored edges in tetraploids. 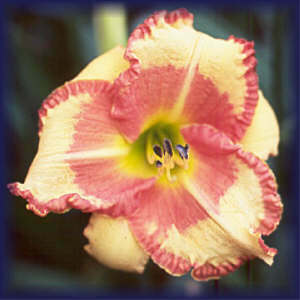 Offspring have eyes and edges (up to 1/2”) in crimson, cranberry, orange, and orange pink as seen in future introduction, JAMAICAN ME HAPPY, and many other seedlings. RASPBERRY BERET is a large flower without any small flowers in the background, and offspring have been large to very large. 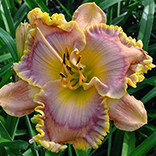 I haven’t seen another line of colored edged daylilies with this extra large size built in. Scapes are tall, very nicely branched, and bud count can reach forty. Evergreen, but a happy northern camper, this is a hybridizers flower because its offspring can be recognized as coming from nowhere else but RASPBERRY BERET! A special thanks to Phil Reilly for his early use of Fooled Me.